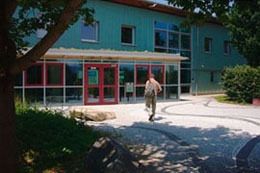 The Academy for Nature Conservation and Landscape Management (ANL) is a public educational and research institution. According to a decision of the Bavarian State Parliament it was established in 1976 and is responsibility of the Bavarian State Ministry for the Environment and Consumer Protection (STMUV). Left: The academy's entrance to the administration building. 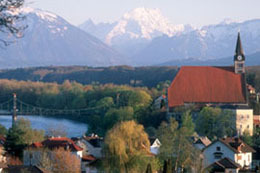 Right: View over the city of Laufen with the collegiate church in the foreground and the Watzmann Mountain in the background. Each year the Academy offers more than 100 events. The Themes are mostly on the latest research results in conservation, landscape management and ecology. 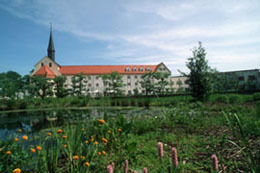 Since 2001 most events are held in the ANL's educational center: the „Kapuzinerhof“ in Laufen. Many specific environmental issues are covered and current policy developments are discussed. This occurs not only in Laufen, but also in other regions of Bavaria. Left: Educational Center of the ANL (Kapuzinerhof). 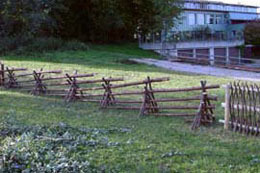 Right: Wooden fence in a traditional style (replica) in front of the administrative building of the ANL. During internships at the ANL, you will learn about the plants and wildlife and get insights into biological and ecological methods. Habitats will be described by their component plant and animal species and ecological relationships among the inhabitants explained. 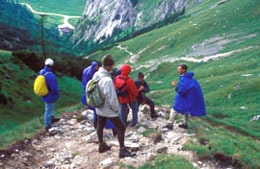 Left: Seminar group during an alpine excursion. 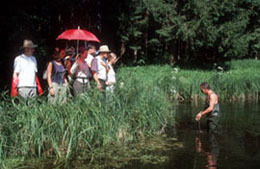 Right: Participants on a field trip viewing water life. The ANL is participating in the nationwide training program for "expert rangers", specialized in nature and landscape conservation (GNL). Course content includes nature conservation and landscape management, public relations, excursion didactics and conflict management. With this training of nature and landscape guides (ZNL), the Academy helps contribute to environmentally sustainable tourism that extends beyond national boundaries. In addition to knowledge about the nature, landscape and local history of the region, the "expert ranger" also learns how to interact with visitors. The courses are open to everyone. 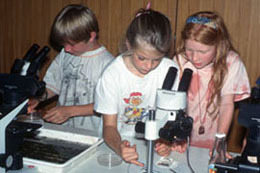 Left: Children looking at and identifying plants. Right: Participants collecting and identifying insects in the ANL’s Research Area “Straß. More than 150 research projects have been conducted by the ANL. 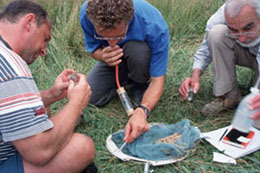 An important criterion in the selection of a research theme is whether it is possible to direct implement the results in conservation practice. The scientific results are presented and discussed in lectures and symposia. What research projects are currently in progress? Among others, projects aiming to restore the Salzach River and implement landscaping concepts and the Habitats Directive of the European Union. In addition, themes relevant to the social sciences, such as the history of nature conservation in Bavaria urban ecology, or sustainable development are covered. Only three kilometers away from Laufen in the Schinderbachtal, the ANL’s Teaching and Research Station "Straß" is found. About 18 hectares of agricultural land were acquired by the Bavarian Nature Conservation Fund and are used by the ANL for teaching and scientific purposes. Maintenance and land utilization are conducted in cooperation with local farmers. The Academy ist committed to the implemenation of EU projects such as Interreg and the natura 2000 pgrogram. It works nationally and internationally together with experts in nature conservation. One focal area is the exchange of scientific knowledge and practical experience, particularly with countries in southeastern Europe. The ANL publishes the latest scientific findings from research and events in various publication series. In addition, information brochures, flyers and CDs are also available. Each members of the executive committee holds office for five full years, makes decisions on the main themes of the activities of the ANL and advises the ANL in strategic situations. The composition of the executive committee is formed as part of the regulation of the ANL. The structure ensures of the committee ist formed such that he representation of different social groups ist ensured. Executive meetings take place twice a year.